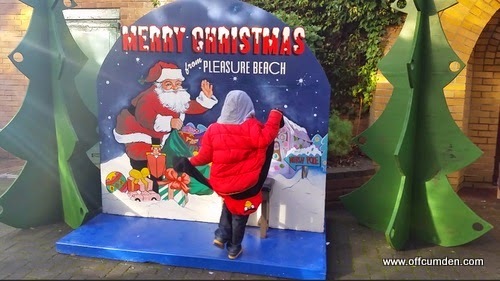 Last weekend we were invited to Blackpool Pleasure Beach to meet Santa Claus and also go ice skating. 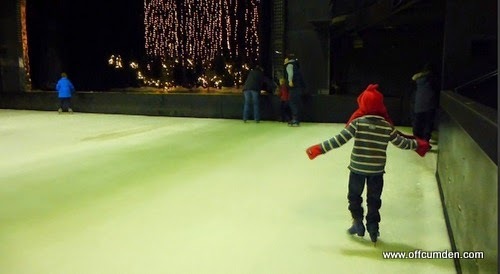 We have only been ice skating once before, so I was keen to go again. Although it was November, it was just about allowed to get into the festive spirit. I am always excited when we get to go and see Santa, it's the kid in me. I just adore Christmas, so we were a rather excitable car full on the hour's journey to Blackpool. When we got to the arena we went straight through to the grotto. We arrived at around 11.15 and I think we were some of the first people there. The elves were really enthusiastic and one even taught my husband and I to juggle! The children were both invited to sit on the chairs next to Santa Claus. Unfortunately my daughter was rather scared and refused to go anywhere near him, she clung to my leg instead and hid behind me. I think both children were slightly disappointed not to receive a 'real' present. Instead they got a voucher, to receive a Blackpool Pleasure Beach Diamond Pass. I thought it was a pretty good present and represented good value for money (the pass is worth £30). When we had met Santa, one of the elves took us into the snow dome which was great fun. I had expected the snow to blow around, but we had to throw it. This kind of made it more fun because we were then having snowball fights with an elf! After the grotto we went ice skating. Sadly my husband had to sit and watch us as he is still having physio on his knee. this left me alone with two children who are unable to skate. Needless to say it was very entertaining. I am amazed that I didn't fall over at any point. My son got the knack of it pretty quickly and he was soon off by himself. My daughter even gave it a go by herself and stayed upright. I was initially disappointed that they didn't have any of the penguins which help younger children on the ice, but actually it meant that my children had to give ice skating a go, and they both ended up doing it by themselves. 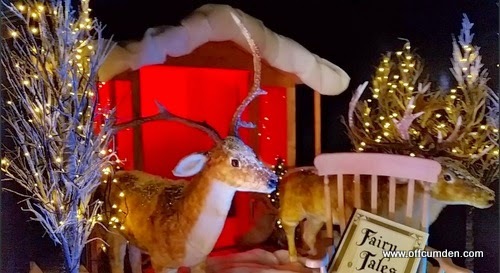 For just £10 per person you can visit Santa, Miss Christmas Eve and Dominic the Elf Extraordinaire in an enchanted winter wonderland full of magic and sparkling lights. 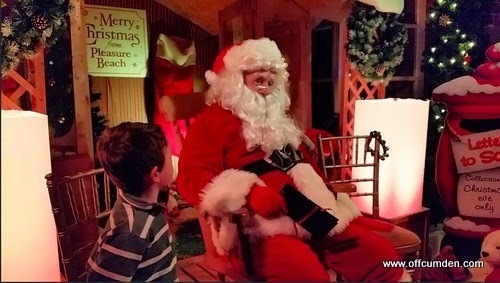 You will also receive a special Grotto gift from Santa, go ice skating in The Arena and enjoy a piping hot drink to escape the chills outside. You can also make friends with the colourful costume characters as Poppy Corn, Miss Kandy Floss and Bradley and Bella Beaver will all be there to welcome children of all ages into the Grotto. Each Grotto ticket holder will receive a special gift from Santa – a Blackpool Pleasure Beach Diamond Pass. This entitles you to a Pleasure Beach Pass for every day of the 2014 season. It gives you admission to the park, riding on the Pleasure Beach Express, explore the Chinese Puzzle Maze, see the Spectacular Dancing Water Show and visit Bradley & Bella’s Learning Garden. Diamond Pass holders can also get a discount off the cost of an Unlimited Ride Wristband. Below is my video review. We had a great day and I thought the grotto was decorated amazingly well. We had a great time ice skating, even if my children did spend most of their time on their bottoms. The hot drinks we got with the grotto tickets were all really appreciated on our chilly walk along the promenade after the morning's entertainment. I think that if you're in the area then it is well worth a visit. I wouldn't recommend travelling a long way to visit though as the grotto is over pretty quickly. I do think it's good value for money though. £10 per person which includes a gift worth £30 for two people, ice skating for four people (including skate hire) and a hot drink for four people. Disclosure: We received four tickets to the grotto (including a gift, ice skating and hot chocolate) for the purpose of review. This had no impact on my post, which is honest and fair.